This, the first in a series of four unique War Diaries produced in conjunction with the Imperial War Museum, will tell a story that is rarely heard: the experiences of a nurse working close to the Western Front in the First World War. 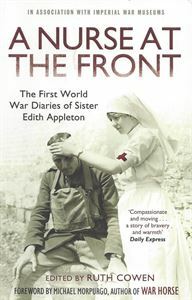 Incredibly, Edith Appleton served in France for the whole of the conflict. Her bravery and dedication won her the Military OBE, the Royal Red Cross and the Belgian Queen Elizabeth medal among others. Her diary details with compassion all the horrors of the 'war to end wars', including the first use of poison gas and the terrible cost of battles such as Ypres, but she also records what life was like for nurses and how she spent her time off-duty. There are moments of humour amongst the tragedy, and even lyrical accounts of the natural beauty that still existed amidst all the destruction.